With grilling season in full swing, I thought it was time to add a new burger recipe. I've made a variety of veggie patties from quinoa spinach cakes to black bean quinoa patties and even broccoli turmeric fritters. It's time to add a paleo burger to the mix with these zucchini basil chicken burgers. Of course I had to slip in some extra veggies in because you know, vegetables, love them. If your loved ones aren't the veggie lovers that I am, then this is a good way to get them to eat it. They won't even know the zucchini is in the burger. If you've been to the grocery store or farmer's market lately, you'll have seen the plethora of zucchini everywhere. Another market mainstay right now is fresh basil. I think the basil works really well with the chicken and zucchini. I do recommend grating the zucchini and thoroughly draining the strands so the chicken patties stay together. Other than that, this is a pretty easy burger recipe to pull together. These zucchini basil chicken burgers are a great summertime dish, but they'll also taste great in the winter and cooked on the stovetop. 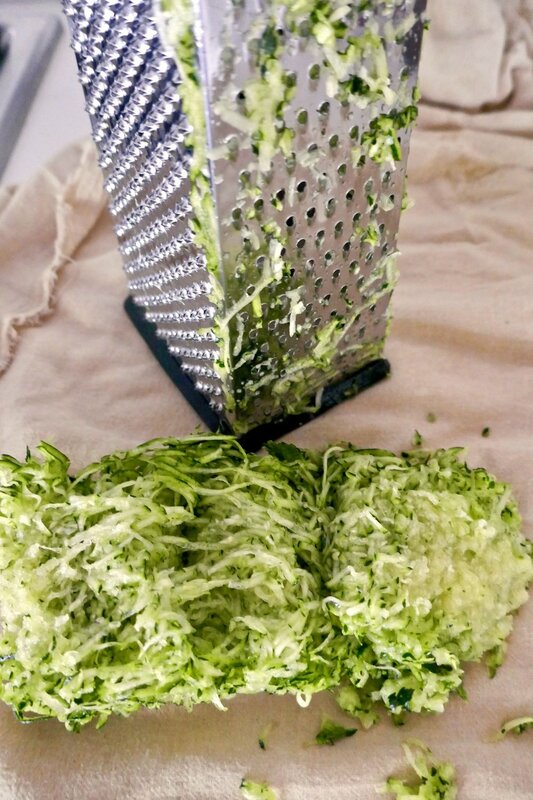 Place a box grater on a piece of cheesecloth. Grate the zucchini on the cheesecloth. Fold in the corners of the cloth and squeeze the excess juice into a jar for future use (like in a green smoothie). Salt the zucchini and allow to sit for a few minutes and then squeeze the excess juice again. Add 1 tablespoon of the ghee or avocado oil to a pan over medium heat. Once warm, add the onions and cook 5-10 minutes until translucent. Then add the celery and cook for about 3 minutes. Lastly add the garlic and stir for about a minute and remove from heat. In a large glass bowl, place the chicken, squeezed zucchini, onion-celery-garlic mixture, and basil. Generously season with salt and pepper. use your hands to thoroughly combine all of the ingredients. Then form 4-5 round patties. Add the other tablespoon of ghee or avocado oil to a pan over medium heat. Place eat patty in the hot pan. You may need to work in batches depending on the size of your pan. Cook about 6 minutes per side or until completely cooked through. Or cook them on the grill. Top with guacamole or your favorite condiments.